THE TEXTURE OF COD LEATHER IS A HIGHLY UNUSUAL COMBINATION OF THE ROUGH WITH THE SMOOTH. THE TEXTURE OF COD LEATHER IS HIGHLY UNUSUAL COMBINATION OF THE ROUGH WITH THE SMOOTH: WHEN WE TAN COD SIN INTO LEATHER, THE RESULTING TEXTURE IS IRREGULAR, ALTERNATING ROUGH AND SMOOTH IN NO DISCERNIBLE PATTERN. WE HAVE NO WAY OF CONTROLLING THE VARIED TEXTURE THAT EMERGES, BUT WE CAN COMPRESS AND VARNISH THE RUGGED SURFACE TO PRODUCE A SMOOTH EAND SILKY VERSION OF COD LEATHER. COD LEATHER IS THIN AND SUPPLE, YET VERY STRONG. THE CLEAR TRIANGULAR SHAPE OF THE COD HIDES MAKE IT IDEAL FOR FISH-PATTERN OR TRIANGLE PANELS. WHETHER RUGGED OR SMOOTH, COD LEATHER IS AN EXCITING NEW MATERIAL TO USE IN DESIGN OF ALL KINDS. Length and width: The size of cod hides is variable. Average length is 40 to 60 cm. The shape of the hide is a neat triangle, 10 to 18 cm across at the neck, tapering back to the tail. Size: Size is measured in square feet. The average size of a cod hide is 0.6 sq.ft. Thickness: Cod hides are 0.4 mm thick on average. Tear strength: Cod leather not tested. 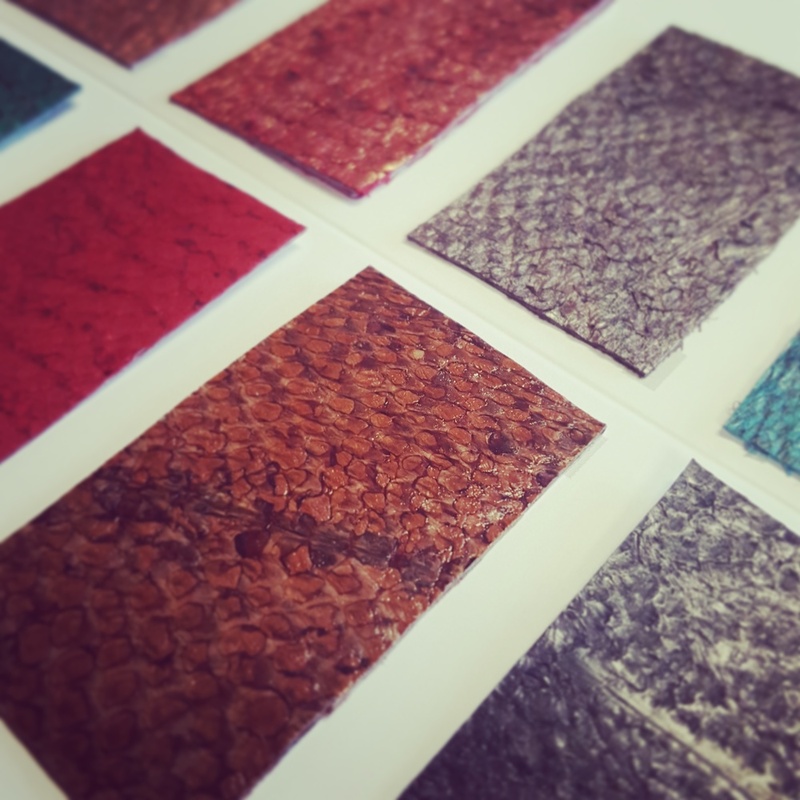 Colors: Thanks to new methods in tanning cod leather, we are now able to offer same color codes in cod as in salmon, but due to differences in the material, the colors may vary between species. Texture: Like salmon and perch leather, cod leather is available in two textures: closed scales (leather is compressed and varnished for a smooth surface), and open scales. With open scales the character of cod leather is very distinct from salmon and perch – or any other leather – with a random alternation of rough and smooth scales. Finishes: Both open-scale and closed-scale textures can be combined with a wide range of finishes: Atlantic Leather offers nearly fifty different finishes. Origin: Throughout the ages, cod has been caught off the coast of Iceland's shores for human consumption, and even today it comprises the largest share of Iceland's seafood exports. Cod is praised by food connoisseurs around the world for its delicate flavor and firm white flesh, and Icelandic "saltfiskur" or bacalao (salted cod) is for instance, a delicacy in Portugal and Spain. Atlantic Leather sources cod hides from Icelandic fisheries companies.